Moving with ease is not the answer to pain care, but part of the answer for most of us. The First 5 Steps of Pain Care for Life will start you on your path towards making ‘moving with ease’ a reality. Please consider these three statements. There IS hope for recovery. People in pain who find ways to move or exercise with ease, add a highly effective technique to their pain care toolkit. Moving with more ease isn’t just the goal, it is an integral aspect of your path towards successful pain care. 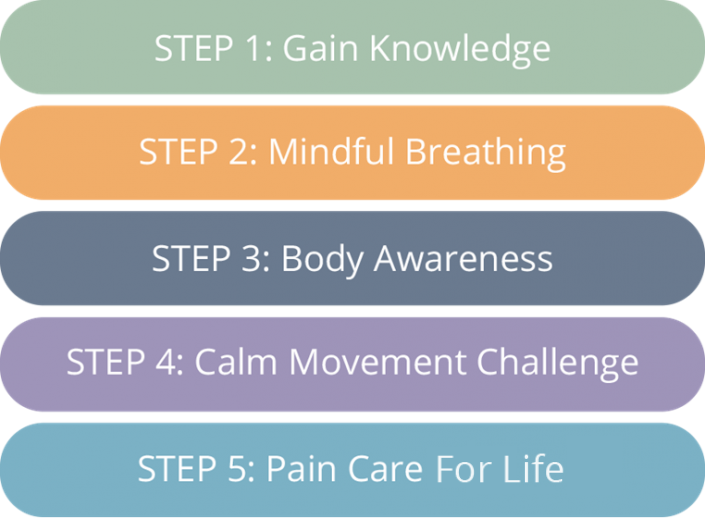 Start with our First 5 Steps, or move right to the full Pain Care for Life curriculum as effective paths to recovery. Many people report less pain, better functional movement and improved quality of life. "Thank you for allowing me to bring your expertise and knowledge into my practice. I've had incredible results using your evidenced-based resources to educate and empower my chronic pain patients. After 18+ years as a practitioner, I have finally found a truly effective and inexpensive resource for people in pain -- An absolute necessity for a busy practitioner who knows the importance of education and pain care instruction, but has limited time! Thanks again for all your hard work developing this quality product." With the Pain Care for Life package, you will access a wealth of knowledge, guided practices and expert approaches; proven to help you reduce your pain, and move toward living well again.